Your photographs are arresting, and this one is exceptional. Are these dill blossoms? I’d like to eat this spider, it looks like fine sugarworks. Pretty capture. 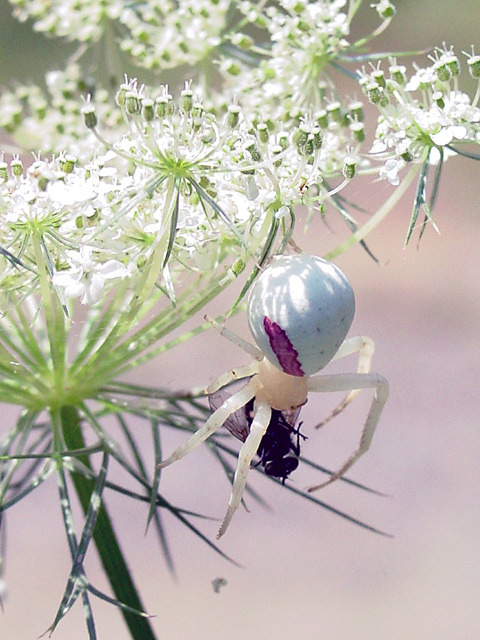 The delicate architecture of the flower, white light and soft pale body of the spider convey a beauty that belies the indelicacies act at hand. Very nice. Oops. Meant – indelicacies at hand. Astonishing photo. The lace shadows on the spider blow me away.